More progress on the solar panel mount has been made. I have been poking more with FreeCAD, in addition to getting greenlit by the municipality. Mounts such as this one don't count as "buildings", so no permit is required. It's not entirely finished; there's still some brackets to be designed that go on the panels which the adjustment bar mounts to and can swing inside. This is for three angles: 45°, 77.5° and 90°. Relevant measurements are how far up and back the panel side swing mount is (topmost hole, 600 mm up and 150 mm back), and where the horizontal support hole that the adjustment bar mounts into should go (700 mm back). The rest of the drawing is related to figuring out how far from the swing hole the other 40 mm holes should go. 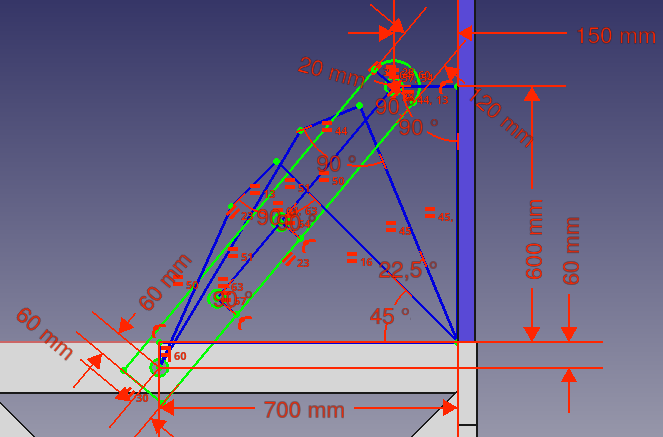 Adding a couple more holes isn't terribly hard, but this drawing shows that the positions of the holes along the bar correspond to the angles linearly enough for eyeballing the reset. 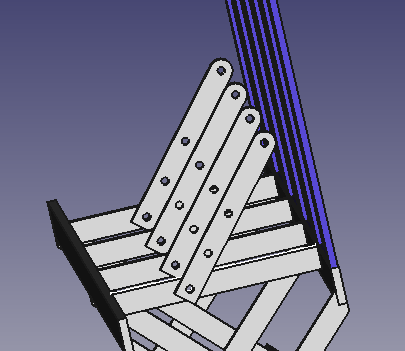 I'm better able to deal with FreeCAD's quirks now, but the inability to specify assembly constraints is still a huge pain. Hopefully 0.17 is released soonish, else I will simply be forced to compile my own.